This box, intended to wine lovers as well as curious beginners, gathers what’s best concerning the wines of Bordeaux and the respect of the environment with a selection of three organic red wines. 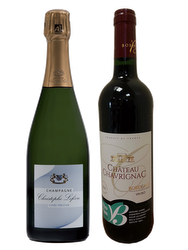 These three wines will make you discover three different designations (PDO). The first that we carefully selected is a Château Langlais 2015, PDO Puisseguin-Saint-Emilion. It is astounding by its amazing suppleness and its smooth and pleasant tannins. 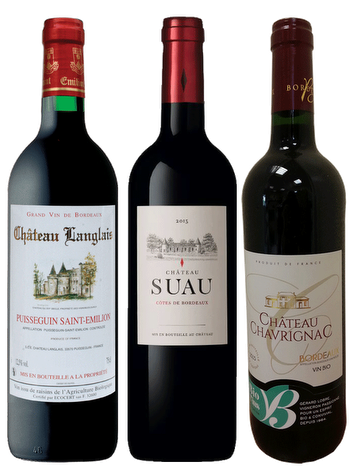 For this selection of organic Bordeaux wines, we chose a Château Suau 2015, PDO Côtes de Bordeaux. It has a wide range of flavors, a great suppleness and a nice temper. Finally, the last wine that completes the trio is the Château Chavrignac 2016, PDO Bordeaux, that allies acidulous and fruity aromas with supple and round tannins.